December is upon us & with that comes a new bulletin board for Mr. Nick's class! I can't help myself; I've said before in other lifetimes I'm sure I'll be an elementary teacher and this is one of the reasons why. I love decorating and sprucing up the classroom with fun & festive things for the students to come back to and be excited about. Nick is so kind in allowing me to have a creative outlet in his classroom & I think that the boards are getting a little better with each try... I'm already brainstorming ideas for next month/year! 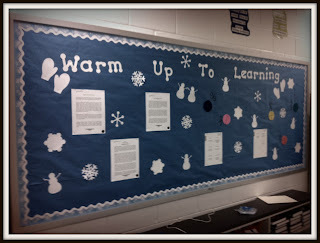 For now, I hope his students are ready to "warm up to learning"!! And a little door decor for the welcome into the room!